384 pages | 128 B/W Illus. 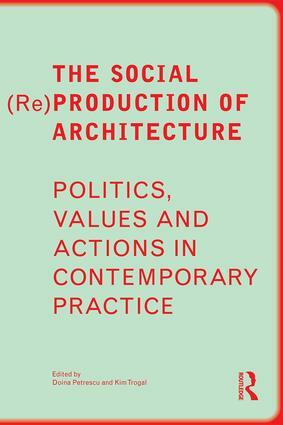 The book features 24 interdisciplinary essays written by leading theorists and practitioners including social thinkers, economic theorists, architects, educators, urban curators, feminists, artists and activists from different generations and global contexts. The essays discuss the diverse, global locations with work taking different and specific forms in these different contexts. A cutting-edge, critical text which rethinks both practice and theory in the light of recent crises, making it key reading for students, academics and practitioners. Doina Petrescu is Professor of Architecture and Design Activism at the University of Sheffield, UK. Kim Trogal is lecturer at the Canterbury School of Architecture, University for the Creative Arts, UK.